The kitchen is the hub of the home in terms of socialising and dishing out the family meals – but it can also provide an organisational point for an interior, as this project by award-winning kitchen designer Kira Gray reflects. “This kitchen forms part of a substantial house extension that includes an expansive living area and links to the outdoors,” says Gray. “The owners wanted the kitchen to sit centrally and interact with all areas, including the living, formal lounge, dining area and the outdoors. 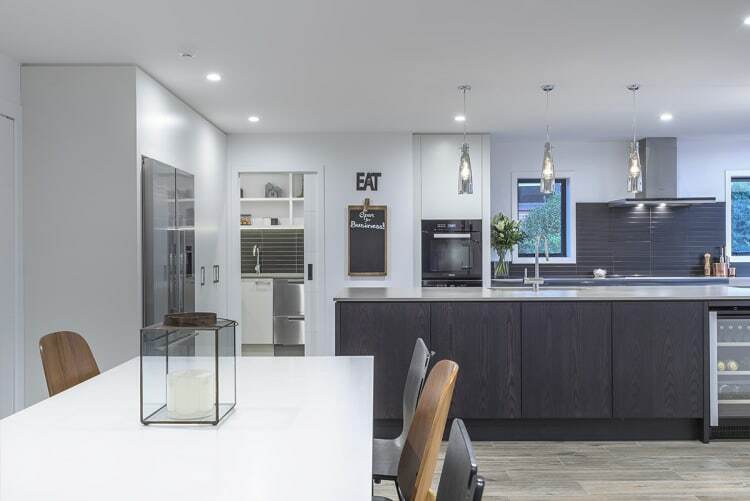 In response, Gray designed the kitchen in the centre of the addition, together with a walk-in scullery for bulk storage, which helps keep on-show surfaces clutter-free when entertaining. “To make more room for multiple chefs, we set defined work areas, with cooking to the side wall, supported by lots of drawers and bench space. The clean-up sink is in the large entertainer’s island, along with glass storage and a bar fridge. For the modern look required, Gray introduced a subtle palette of black, white and grey. Dark wood accents bring depth and interest. “Howeowners’ brief met – an elegant family kitchen, ideal for entertaining,” Gray says.